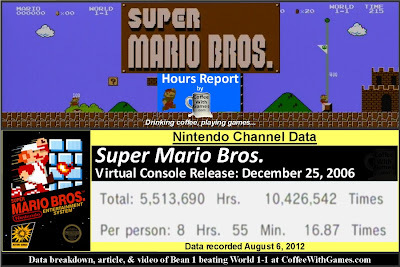 Super Mario Bros. has approximately 618,052 U.S. Wii owners that have reported game-play hours through the Nintendo Channel, with 2,051 days possibly reported. The game has an average play-time per day/session of about 31 Minutes, with its overall average time reported being 8 Hours 55 Minutes as the image above shows. What about critic and customer reviews for the game? Well, like many older re-released games there is no "professional" critic review score average on GameRankings.com, or MetaCritic.com. Fortunately, Amazon.com has a decent number of customer reviews for the game. Amazon.com's customer review score average for Super Mario Bros. is currently 90.95% based on 42 reviews. While the reviews aren't necessarily for the Virtual Console version of the game, the game-play from the original game to the Virtual Console version is basically identical, with the Virtual Console version even having the "Minus World" glitch. Surprisingly, Super Mario Bros. has made Nintendo about $3,090,260 from its Virtual Console release in the United States, just based on the approximate number of U.S. Wii owners that have reported data and the game's $5 price point. Why do I find it surprising? Well, Super Mario Bros. has earned about one million less than another Super Mario Bros. NES Virtual Console title, at least according to the reported data. We are having a blast playing through different Mario games together, and he is currently really enjoying New Super Mario Bros. on the DS. He has completed a few of the levels in that game by himself as well, and we actually finished the game (minus the two optional Worlds) not even 48 hours ago. As for the reported game-play data on Super Mario Bros., knowing the game is only $5 and the average Wii owner has gotten over 8 hours of game-play from it I think is great. 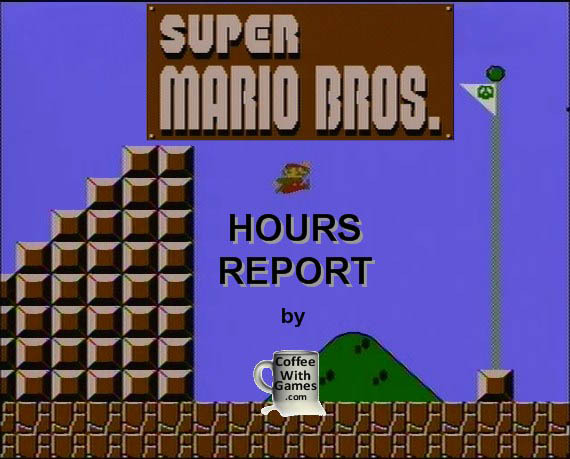 Many of the hours reported are probably players just attempting to beat the game a single time, based on my own history with it and some friends' as well. While the game is short from start to finish, especially if you know the warps, I find the platforming elements and difficulty to be challenging enough, and well worth the $5 asking price. If you have wondered what the original Super Mario Bros. game is like and have never played it, I would highly suggest purchasing the Wii's Virtual Console version for only $5. If you are a fan of getting games in their original format though, you can currently purchase Super Mario Bros. "new" from a seller on Amazon.com for only $2,999.99. If you have never played Super Mario Bros. is it a game you are interested in? If you have played Super Mario Bros., do you have any great memories of playing the game by yourself, or perhaps watching a friend and/or family member play it? Also, if there are any parents out there reading this with little ones that play Mario games, do you perhaps remember how young your child was when they beat their first Mario level? I definitely recall when I first played Mario for myself back on my NES. The first world you encounter a night sky kind of surprised me because it was so different than what i had seen so far. The castles and that music were always particularly exciting for me as well. There was something about them that just hit a sweet spot for me as a kid. The first time Bowser started to chuck hammers blew me away, and that last castle's maze-like approach definitely made me work for my win. I can't really recall a specific age. All of my kids played this and other Mario titles as they got older, but I still had a bunch of my old game systems and games around. As a result, I had an NES hooked up to a TV when my son was little, and it seems like he's been playing games forever. "The first world you encounter a night sky kind of surprised me because it was so different than what i had seen so far." Is that World 5? 6? 3? LOL, I was just playing it tonight, but we were using the warp pipes! "The castles and that music were always particularly exciting for me as well." Yup, the castles and even "underground" levels music was a great choice, and Bean 1 used to say, "Ohhhh, the scary music!" when we would drop into World 1-2. Bean 1 absolutely loves the castle levels though, and that is the most requested levels to "beat" by him. Whether it's in SMB, SMB3, SMW, or now NSMBDS; castles are the go to levels for me to beat. I think it may have even been world 3? that shows you how long it's been since *I* actually played. Music-wise, one of my favorite moments was in SMB 3 where they took the underground music from SMB1 and slightly retooled it for 3 with a nice, slightly echo-y sound that really stuck with me at the time. Kind of funny how the castles are 'dad's problem', but that was the case for me when the kids were younger too. It could be world 3, as I always skip that one; but now that you mention it I think it is from when I used to skip the warp.